Poḷonnaruwa (Sinhalese: පොළොන්නරුව, Poḷonnaruwa or Puḷattipura, Tamil: பொலன்னறுவை, Polaṉṉaṟuvai or Puḷatti nakaram) is the main town of Polonnaruwa District in North Central Province, Sri Lanka. Kaduruwela area is the Polonnaruwa New Town and the other part of Polonnaruwa remains as the royal ancient city of the Kingdom of Polonnaruwa. The second most ancient of Sri Lanka's kingdoms, Polonnaruwa was first declared the capital city by King Vijayabahu I, who defeated Chola invaders in 1070 to reunite the country once more under a local leader. The Ancient City of Polonnaruwa has been declared a World Heritage Site. Currently the new Polonnaruwa is undergoing a major development project known as the "Awakening of Polonnaruwa" under the concept of President Maithripala Sirisena. It envisions the development of all sectors in Polonnaruwa including roads, electricity, agriculture, education, health and environment will be developed comprehensively. The Cholas shifted the capital city to Polonnaruwa since they found it had the best fertile lands in Sri Lanka (nigaril valanadu (uncomparable fertile land)) was name for the district and named Polonnaruwa- Jananathamangalam. The Mahaweli river flowing through it can take you to the sea. Vijayabahu's victory the real "Hero of Polonnaruwa" of the history books is actually Parakramabahu I. It was his reign that is considered the Golden Age of Polonnaruwa. Trade and agriculture flourished under the patronage of the king, who was so adamant that no drop of water falling from the heavens was to be wasted and each was to be used toward the development of the land. Hence, irrigation systems that are far superior to those of the Anuradhapura Age were constructed during Parakramabahu's reign - systems which to this day supply the water necessary for paddy cultivation during the scorching dry season in the east of the country. The greatest of these systems is the Parakrama Samudra or the Sea of Parakrama. The Kingdom of Polonnaruwa was completely self-sufficient during King Parakramabahu's reign. With the exception of his immediate successor, Nissankamalla I, all other monarchs of Polonnaruwa were slightly weak-willed and rather prone to picking fights within their own court. They also went on to form more intimate matrimonial alliances with stronger South Indian kingdoms until these matrimonial links superseded the local royal lineage. This prompted an invasion by the Aryacakravarti dynasty King Kalinga Magha in 1214, who founded the Jaffna kingdom (1215-1624 CE). Today the ancient city of Polonnaruwa remains one of the best planned archaeological relic cities in the country, standing testimony to the discipline and greatness of the Kingdom's first rulers. Its beauty was also used as a backdrop to filmed scenes for the Duran Duran music video Save a Prayer in 1982. The ancient city of Polonnaruwa has been declared a World Heritage site by UNESCO. Near the ancient city, there is a small town with several hotels (especially for tourists) and some glossy shops, and places to fulfill day-to-day needs. There are government institutions in a newly built area called “new town,” about 6 km away from the town and the main road. The largest school in the district, Polonnaruwa Royal Central College is situated at new town. Polonnaruwa is the second largest city in North Central Province, but it is known as one of the cleanest and more beautiful cities in the country. The green environment, amazing ancient constructions, Parakrama Samudra (a huge lake built in 1200), and attractive tourist hotels and hospitable people, attract tourists. Another draw for tourists is the city's population of toque macaques. The monkeys have been living in the ruins since human occupation and continue to thrive here long after the humans left. ^ "Ancient City of Polonnaruwa". World Heritage Convention, UNESCO. Retrieved 21 May 2015. ^ "President commences "Pibidemu Polonnaruwa" - The official website of the President of Sri Lanka". www.president.gov.lk. Retrieved 2015-11-16. 'The Satmahal Prasada: A Historic link between Lan Na and Sri Lanka', in: Forbes, Andrew, and Henley, David, Ancient Chiang Mai Volume 1. Chiang Mai: Cognoscenti Books, 2012. 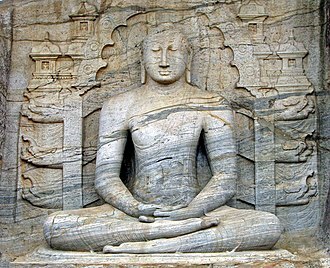 Wikimedia Commons has media related to Polonnaruwa. 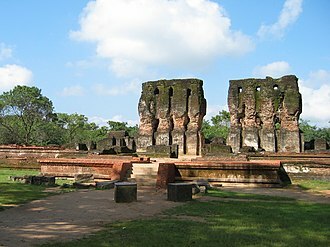 Wikivoyage has a travel guide for Polonnaruwa. The Aryacakravarti dynasty were kings of the Jaffna Kingdom in Sri Lanka. Political and military leaders of the family name left a number of inscriptions in the modern-day Tamil Nadu state, with dates ranging from 1272 to 1305. They ruled the Jaffna kingdom from the 13th until the 17th century, the origins of the Aryacakravarti are claimed in contemporary court chronicles, modern historians offer some competing theories. They administered land and held important military ranks and it is believed that most of them belonged to one family of Tamil Brahmins in the modern Ramanathapuram District who had become prominent during the days of the Pandyan king Maravarman Kulasekaran. Furthermore, the title Cakravarti seem to have commonly used in the Pandyan kingdom as a caste or job title. Compound titles exist, such as Maravacakravarti that belonged to a Maravar chief as well as Malavacakravarti that belonged to a Malava chief, ariyar in Tamil could denote a noble or a learned person, a Brahmin or alternatively a person from Aryavarta. Thus the title Arayacakravarti seems to fit the structure of similarly used titles across the Pandyan kingdom and he caused a second inscription in Tirupulani in Ramanathapuram to be engraved thus indicating he was a minister or a feudatory. Notably the inscriptions had the epithet Cetumukam signifying in the order of Cetu, the source claims that two out of the 512 were selected as Kings of Ariyars. During Jatavarman Sundara Pandyans rule the Pandyas overwhelmed their Hoysala enemies, in the opinion of Rasanayagam Mudaliar and Swami Gnanapragasar the Aryacakravarti dynasty was connected to the Eastern Ganga Dynasty. Rasanayagam believes that a Brahmin from the town of Rameswaram married into the family members of the Kalinga Magha. Magha apparently belonged to the Eastern Ganga Dynasty, the Royal flag of the Jaffna kingdom is similar to the Royal insignia of the Eastern Gangas. Gangas themselves claimed Brahmin origins, the Setu coins minted by the Aryacakravarti kings have a similar symbol. Rankoth Vehera is a stupa located in the ancient city of Polonnaruwa in Sri Lanka. The stupa was built by Nissanka Malla of Polonnaruwa, who ruled the country from 1187 to 1196, the Rankoth Vehera has been built according to the tradition of the stupas of the Anuradhapura Maha Viharaya and bears a close resemblance to Ruwanwelisaya. In fact, a stone inscription situated close to the stupa even identifies it by the name Ruwanweli, however, it has come to be known by the currently used name, Rankoth Vehera. In Sinhalese, ran means gold, kotha is the given to the pinnacle of a stupa. Thus, the name Rankoth Vehera can be translated to English as Gold Pinnacled Stupa. Along with the Kiri Vehera, it is one of the most revered stupas in Polonnaruwa, Rankoth Vehera is structure made entirely of brick, and has a base diameter of 550 feet and a height of 108 feet. Despite this, it remains the largest stupa in the ancient city of Polonnaruwa, the stupa has four large Vahalkadas, a structure used for offering flowers and to support the weight of a stupa. Save a Prayer is the sixth single by Duran Duran, released on 9 August 1982. The song was the single from the bands second album Rio. 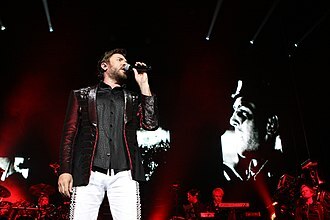 It became Duran Durans biggest hit to date in the UK Singles Chart, reaching #2, the track opens with a somewhat eerie synthesizer riff which plays in the background throughout the song. It was not originally issued as a single in the United States, a special US single version was finally released in January 1985 and reached #16 on the Billboard Hot 100. As well as being a success, the song has received critical acclaim. AllMusic journalist Donald A. Guarisco described the song in a retrospective review, the video was filmed by director Russell Mulcahy among the jungles and temples of Sri Lanka in April 1982. Scenes were filmed atop the ancient rock fortress of Sigiriya, among the ruins of a Buddhist temple at Polonnaruwa, the shoot was a difficult but memorable experience for the band. 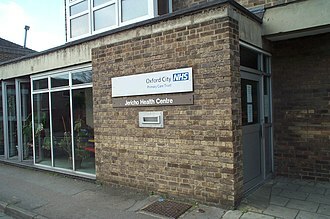 Simon Le Bon and Roger and John Taylor went ahead to the location while Andy Taylor and Nick Rhodes were in London finishing mixes for the Rio album and B sides. They had almost no time after that was done to change clothes before catching their flight, when they arrived in Colombo, it was very hot, and Rhodes was uncomfortable in his clothing. Taylor reassured him they would be in their hotel soon and could relax, the driver who met them in a flatbed truck informed them it would be several hours driving time to Kandy in the centre of the country, where the band were lodged. Along the way they were struck by the poverty they witnessed, during the filming of the scene where the band members were riding elephants, a female elephant made a strange sound. One of the crew had recorded it, and found it funny enough to play back and it turned out to be the elephants mating call, which led the elephant carrying Roger Taylor to charge downhill and attempt to mount the female. It was funny as hell, but quite hairy for a moment, while perched on a branch over a lagoon and miming playing his guitar, an intoxicated Andy Taylor fell into the water. He accidentally imbibed some, and had to be hospitalized during the bands subsequent Australian tour due to a virus he contracted at that time. Sigiriya or Sinhagiri is an ancient rock fortress located in the northern Matale District near the town of Dambulla in the Central Province, Sri Lanka. The name refers to a site of historical and archaeological significance that is dominated by a column of rock nearly 200 metres high. According to the ancient Sri Lankan chronicle the Culavamsa, this site was selected by King Kasyapa for his new capital and he built his palace on the top of this rock and decorated its sides with colourful frescoes. On a small plateau about halfway up the side of rock he built a gateway in the form of an enormous lion. The name of place is derived from this structure —Sīhāgiri. The capital and the palace was abandoned after the kings death. It was used as a Buddhist monastery until the 14th century, Sigiriya today is a UNESCO listed World Heritage Site. It is one of the best preserved examples of ancient urban planning, the environment around the Sigiriya may have been inhabited since prehistoric times. There is clear evidence that the rock shelters and caves in the vicinity were occupied by Buddhist monks. 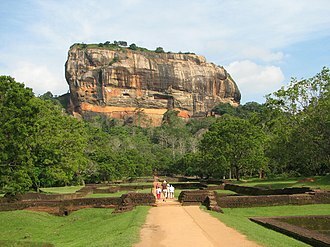 Buddhist monastic settlements were established during the 3rd century BCE in the western and northern slopes of the hills surrounding the Sigiriya rock. Several rock shelters or caves were created during this period and these shelters were made under large boulders, with carved drip ledges around the cave mouths. Rock inscriptions are carved near the ledges on many of the shelters. These were made in the period between the 3rd century BCE and the 1st century CE, in 477 CE, the king’s son by a non-royal consort, seized the throne from King Dathusena, following a coup assisted by Migara, the King’s nephew and army commander. The rightful heir, fearing for his life, fled to South India, afraid of an attack by Moggallana, Kashyapa moved the capital and his residence from the traditional capital of Anuradhapura to the more secure Sigiriya. During King Kashyapa’s reign, Sigiriya was developed into a complex city, most of the elaborate constructions on the rock summit and around it, including defensive structures and gardens, date from this period. Colombo is the commercial capital and largest city of Sri Lanka. According to the Brookings Institution, Colombo metropolitan area has a population of 5.6 million and it is the financial centre of the island and a popular tourist destination. It is located on the west coast of the island and adjacent to Sri Jayawardenepura Kotte, Colombo is often referred to as the capital since Sri Jayawardenepura Kotte is within the urban area of, and a satellite city of, Colombo. It is the capital of Western Province, Sri Lanka. Colombo is a busy and vibrant place with a mixture of life and colonial buildings. It was the capital of Sri Lanka until 1982. Due to its harbour and its strategic position along the East-West sea trade routes. It was made the capital of the island when Sri Lanka was ceded to the British Empire in 1815, in 1978, when administrative functions were moved to Sri Jayawardenepura Kotte, Colombo was designated as the commercial capital of Sri Lanka. The main city is home to a majority of Sri Lankas corporate offices, the name Colombo, first introduced by the Portuguese in 1505, is believed to be derived from the classical Sinhalese name කොලොන් තොට Kolon thota, meaning port on the river Kelani. Another belief is that the name is derived from the Sinhalese name කොල-අඹ-තොට Kola-amba-thota which means Harbour with leafy mango trees, the author of the oldest Sinhalese grammar, written in the 13th century wrote about a category of words that exclusively belonged to early Sinhalese. It lists naramba and kolamba as belonging to an indigenous source, kolamba may be the source of the name of the commercial capital Colombo. As Colombo possesses a harbour, it was known to Indian, Persians, Arabs. Traveller Ibn Batuta who visited the island in the 14th century and their descendants now comprise the local Sri Lankan Moor community. Portuguese explorers led by Dom Lourenço de Almeida first arrived in Sri Lanka in 1505, as part of the treaty, the Portuguese were given full authority over the coastline in exchange for the promise of guarding the coast against invaders. They were allowed to establish a trading post in Colombo, within a short time, they expelled the Muslim inhabitants of Colombo and began to build a fort in 1517. Sri Lanka, officially the Democratic Socialist Republic of Sri Lanka, is an island country in South Asia near south-east India. Sri Lanka has maritime borders with India to the northwest and the Maldives to the southwest, Sri Lankas documented history spans 3,000 years, with evidence of pre-historic human settlements dating back to at least 125,000 years. Its geographic location and deep harbours made it of strategic importance from the time of the ancient Silk Road through to World War II. Sri Lanka was known from the beginning of British colonial rule until 1972 as Ceylon, Sri Lankas recent history has been marred by a thirty-year civil war which decisively ended when the Sri Lankan military defeated the Liberation Tigers of Tamil Eelam in 2009. A diverse and multicultural country, Sri Lanka is home to many religions, ethnic groups, in addition to the majority Sinhalese, it is home to large groups of Sri Lankan and Indian Tamils, Burghers, Malays and the aboriginal Vedda. Sri Lanka has a rich Buddhist heritage, and the first known Buddhist writings of Sri Lanka, Sri Lanka is a republic and a unitary state governed by a semi-presidential system. The legislative capital, Sri Jayawardenepura Kotte, is a suburb of the capital and largest city. Along with the Maldives, Sri Lanka is one of the two countries in South Asia that are rated among high human development on the Human Development Index. In antiquity, Sri Lanka was known to travellers by a variety of names, according to the Mahavamsa, the legendary Prince Vijaya named the land Tambapanni, because his followers hands were reddened by the red soil of the area. In Hindu mythology, such as the Mahabharata, the island was referred to as Lankā, in Tamil, the island is referred to as Eelam. 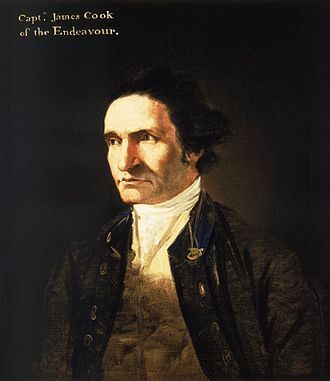 Ancient Greek geographers called it Taprobanā or Taprobanē from the word Tambapanni, as a British crown colony, the island was known as Ceylon, it achieved independence as the Dominion of Ceylon in 1948. The country is known in Sinhalese as Śrī Laṃkā and in Tamil as Ilaṅkai, in 1972, its formal name was changed to Free and Independent Republic of Sri Lanka. Later in 1978 it was changed to the Democratic Socialist Republic of Sri Lanka, as the name Ceylon still appears in the names of a number of organisations, the Sri Lankan government announced in 2011 a plan to rename all those over which it has authority. The Polonnaruwa Vatadage is an ancient structure dating back to the Kingdom of Polonnaruwa of Sri Lanka. Both these venerated relics would have given the structure a great significance and importance at the time. Located within the ancient city of Polonnaruwa, it is the best preserved example of a vatadage in the country, abandoned for several centuries, excavation work at the Polonnaruwa Vatadage began in 1903. Built for the protection of a stupa, the structure has two stone platforms decorated with elaborate stone carvings. The lower platform is entered through an entrance facing the north. The upper platform, surrounded by a wall, contains the stupa. Four Buddha statues are seated around it, each facing one of the entrances, three concentric rows of stone columns had been positioned here, presumably to support a wooden roof. The entire structure is decorated with stone carvings, some of the carvings at the Polonnaruwa Vatadage, such as its sandakada pahanas, are considered to be the best examples of such architectural features. Although some archaeologists have suggested that it had a wooden roof, theories vary among archaeologists and historians regarding who built the Polonnaruwa Vatadage, and when. One such theory suggests that it was built by Parakramabahu I during his reign in the 12th century, the Culavamsa, an ancient chronicle, mentions that he built a circular stone shrine to hold the tooth relic of the Buddha. Archaeologist Harry Charles Purvis Bell believed that this shrine is the Polonnaruwa Vatadage and this is contradicted by several ancient sources of the island, including Rajavaliya and Poojavaliya, which mention that it was built by Nissanka Malla. However, according to the studies of Arthur Maurice Hocart, Nissanka Malla only renovated an existing building and made some additions such as the entrance. Wilhelm Geiger, who translated the ancient Mahavamsa, and historian H. W. Codrington both agree with this theory, a nearby stone inscription set by Nissanka Malla lists the Vatadage among his constructions. Anuradhapura is a major city in Sri Lanka. It is the city of North Central Province, Sri Lanka. Anuradhapura is one of the ancient capitals of Sri Lanka, famous for its ruins of an ancient Sri Lankan civilization. It was the capital of the Kingdom of Rajarata, following the kingdoms of Tambapanni. The city, now a UNESCO World Heritage Site, was the center of Theravada Buddhism for many centuries, the city lies 205 km north of the current capital Colombo in Sri Lankas North Central Province, on the banks of the historic Malvathu Oya. It is one of the oldest continuously inhabited cities in the world and it is believed that from the fourth century BC until the beginning of the 11th century AD it was the capital of the Sinhalese. During this period it remained one of the most stable and durable centers of political power, the ancient city, considered sacred to the Buddhist world, is today surrounded by monasteries covering an area of over sixteen square miles. Protohistoric Iron Age Although according to records the city was founded in the 5th century BC. Very little evidence was available about the period before the 5th century BC, further excavations in Anuradhapura have uncovered information about the existence of a protohistoric habitation of humans in the citadel. The protohistoric Iron Age, which spans from 900 to 600 BC, marked the appearance of iron technology, pottery, in the time period 700 to 600 BC, the settlement in Anuradhapura had grown over an area of at least 50 hectares. 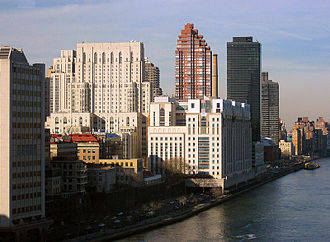 The city was situated of major ports northwest and northeast. It was surrounded by irrigable and fertile land, the city was buried deep in the jungle providing natural defence from invaders. Lower Early Historic period The Lower Early Historic period, spanning from 500 to 250 BC, is studied on the lines of the chronicles, during this time King Pandukabhaya formally planned the city, with gates, quarters for traders etc. The city at the time would have covered an area of 1 square kilometre makes it one of the largest in the continent at the time. A hermitage was made for many ascetics, eastward of that same cemetery and it is believed that King Pandukabhaya made it his capital in the 4th century BC, and that he laid out the town and its suburbs according to a well-organized plan. Royal Central College - Polonnaruwa is a national school in Polonnaruwa, Sri Lanka. Royal Central College was founded by government minister C. P. de Silva on the lines of the Royal College, Silva laid the foundation stone of the school on 19 April 1959. Six years the school was opened for local children, scholarships were offered to students in Polonnaruwa and Trincomalee districts. The main objective of the school was to give educational opportunities for the children of farmers. The school owned 54 acres of land and paddy fields, at the beginning students were recruited to grade 9 and upwards. Students were selected for art and science classes by scholarship examination in grade 8, karunathilaka was the schools first principal and R. W. Galahitiyawa was the vice principal. The school had around 22 staff in 1965, the school was closed in 1971 due to the JVP insurrection. No education was carried out at the school for three years, commerce classes were held in the irrigation office and science classes was held at Topawewa School. The toque macaque is a reddish-brown-coloured Old World monkey endemic to Sri Lanka, where it is known as the rilewa or rilawa. With age, the face of females turn slightly pink, prominent in the subsp. M. s. sinica is found from the Vavuniya, Mannar, up to the lowlands of Anuradhapura, Polonnaruwa and Kurunegala along the zone of Monaragala. M. s. aurifrons can be found sympatrically with subsp, sinica within intermediate regions of the country, such as Kegalle, parts of Kurunegala. They are found in parts of the island including Galle. M. s. opisthomelas is recently identified as a separate subspecies and it can be found in the entire south-western region of central hill, and Nuwara Eliya districts. They can be seen around the Hakgala Botanical Garden and other cold climatic montane forest patches, S. opisthomelas is similar to subsp. Aurifrons, but has a fur and contrasting golden color in the anterior part of its brown cap. The three subspecies can be identified through the orientation of their different hair patterns, the social status is highly structured in toque macaques, where they prevail dominance hierarchies among both males and females. Females change the number of composition within a troop. A troop may consist very few as 8 to large as 40, when the troop becomes too much, social tension and aggression towards each other arise, which giving some individuals to flee from the troop. This is remarkable in adults and sub adults, where a troop may consist largely with females, newly appointed alpha male show aggressiveness towards females, which results flee. There are sightings, where there are fights between individuals of the same troop and some gets heavy wounds to cheeks, eyes. When in estrous, the females perineum becomes reddish in color and this change is a signal to the males that she is ready to mate. There is an average of 18 month between births, after a 5–6 month gestation period, female macaque give birth to a single offspring. Offspring hold on to their mothers for about 2 months, during this time they learn survival techniques and social skills critical for survival. The infants are born into their classes based on their mothers position in the troop. Tradition claims that the Nallur Kandaswamy Temple was constructed by the first Aryacakravarti king. Duran Duran at the Scotiabank Arena, Toronto in April 2005. The images of Gal Vihara, carved on a single, large rock face. The seated image, which depicts the dhyana mudra, shows signs of Mahayana influence. 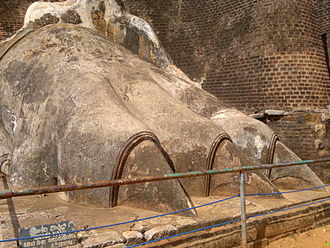 The reclining image, which depicts the Buddha's parinirvana, is the largest in Gal Vihara. The formal ceremony marking the start of self-rule at Independence Square. One of the four doorways leading to the Vatadage. The Polonnaruwa Vatadage as seen today. One of the Buddha statues on the upper platform, positioned next to the stupa. The brick wall is visible on the background. 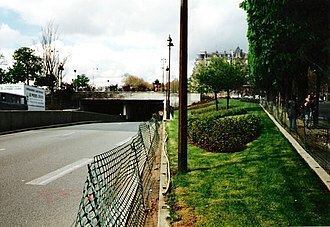 The entrance to the Hatadage. The three Buddha statues inside the shrine. 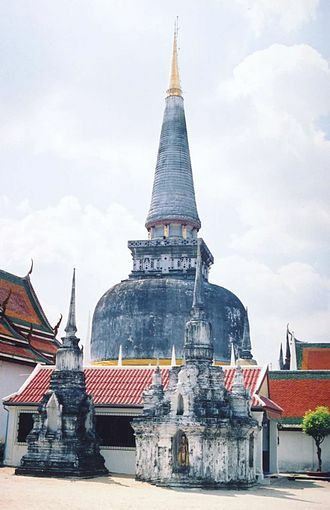 Jetavanaramaya, one of the many massive stupas raided during Magha's reign.